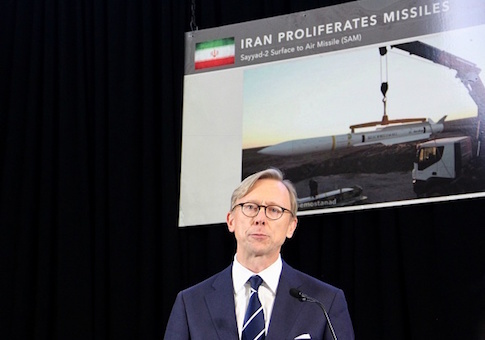 Hook said the United States would continue its pressure campaign against Iran, including the escalation of sanctions, until the regime alters its behavior. He pressed European allies to join the effort. "Despite this clear evidence, not all countries are convinced of the need to take action," he said. "Too many remain on the sidelines, arguing that now is not the time to pressure the regime, but this approach has enabled, and will continue to enable, Tehran to expand its presence in the region and become a more destructive force in the Middle East—to say nothing of Europe." He said the international reliance on the Iran nuclear agreement has established "unacceptably low expectations" for Tehran. The United States withdrew from the accord in May. "The Iran nuclear deal has created a climate where so long as Iran is in compliance with a nonproliferation deal of modest gains and temporary benefits, that so long as Iran is in compliance with this deal, somehow they're in compliance with all sorts of international norms and standards," he said. "The fact of the matter is during the implementation of the Iran nuclear deal, Iran has expanded its threats to peace and security in almost every category." Behnam Ben Taleblu, a research fellow at the Foundation for Defense of Democracies, said the State Department display Thursday offered "significant material evidence of Iranian support for some of the Middle East's worst actors." "Washington must work to translate these displays into effective results," Taleblu said. "That means broadening support for American sanctions and supporting European measures that target Tehran's non-nuclear malign activity." Hook maintained that military action against Iran is still an option if necessary. This entry was posted in National Security and tagged Iran, State Department, Trump Administration. Bookmark the permalink.